What are Bad Links & Bad Link Profiles? This guide assumes that you are familiar with the fundamentals of what backlinks are and a good portion of the language and metrics used to describe them. If this is all completely new to you, please red our introduction to backlinks first. Being familiar with what links are and their potential value to your SEO strategy, you will likely be aware of the fact that backlinks fall of a spectrum of quality. Although you may be familiar with targeting higher authority links, authority is not the only relevant measure of a link. In either large enough numbers of when they constitute a significant percentage of all backlinks, these can create a bad / unhealthy link profile. We discuss these categories in more depth below. As mentioned, link quality is paramount when building links or assessing a link profile… However, it’s not always as simple as looking at a number and determining whether it’s too high or too low. Consequently, identifying quality links isn’t always as easy as it could be. Google don’t want you to try and manipulate their algorithm by partaking in a range of specified activities, we cover these activities later in this guide. You can read what Google have to say here. That being said, Google’s algorithm could not function if it were not for backlinks, they use these to determine the authority and trustworthiness of a site. They also use these links to identify new content on the web… So, it is safe to say that Google don’t mind you building links, they just want you to do it in a specific way. Google have essentially created two categories of backlink, editorial and non-editorial… They favour editorial links and in most cases no not trust non-editorial links. An editorial link is essentially a link that has had to pass through some kind of editorial process before being published. A guest blog post for example, has to be approved and posted by the site owner and in this case, would be considered ‘editorial’. Conversely a site that allows anyone to upload anything and get a link is not considered ‘editorial’. The key value that an editorial link provides, is that it’s harder to spam or manipulate Google with it… The presumption is that in most cases an editorial link will be more relevant to the user if a human has put it on their site. Th difference between these two categories has nothing to do with the actual content most of the time… What we mean by this is that a piece of content uploaded editorially to a blog that exclusively published editorial content will be less likely to be considered spam; than say, the same piece of content posted on a non-editorial site. Where you link from matters as much if not more than the content you use to link with. This category will typically include free directories, bookmark sites and such like… It’s easy enough to spot; if you can sign up, login and start creating links and at no point does anyone review either the links or the content… That’ll be a non-editorial link. Now, if you’re thinking; well that sounds like Facebook, Pinterest, YouTube and a bunch of other popular marketing channels… Well, welcome to the grey area! In reality, you are never going to get penalised from posting on Facebook, Pinterest or YouTube; Google recognises that this is a typical activity most companies do to promote their content. That said, these links are not that valuable from an SEO perspective for the very fact that they are largely non-editorial. This Boolean operation allows us to easily segment links into one of two categories, where one is worse than the other, but there are is still the question of what quality is the link. You can use metrics like Majestic’s Trust Flow as good indicator but you will find that smaller sites, especially local businesses will often have very low scores due to the low volume of links and link sources. So a low Trust Score in many tools does not specifically indicate the quality of the site being actually dangerous. You need to look at the link profile of a site in the context of competitor data… If you and your competitors all have a broadly similar number of links, you can see where the trust metric for your site falls. In some of this analysis there are no objective rules to live by; what is low quality in one area might be acceptable in another. Not all low-quality link profiles are penalised, so you need to know where it appears safe to sit in the spectrum. We cover identifying bad links later in this guide. As we have mentioned, a poor link profile can land you with a penalty from Google, the severity and type will depend on a number of factors… None of the outcomes of a penalty are good though! If this occurs, you will see a drop in organic traffic and revenue, which will not return until the penalty is lifted. This is not a situation anyone wants to be in, so its hugely beneficial for most businesses to take every measure to avoid receiving a penalty. Penalties come in two flavours and either can be triggered by a poor link profile. These are penalties that Google’s algorithm itself applies to your site or pages within it, which means that there isn’t a human directly penalising you. If the algorithm is unsure about a link profile, it will defer to a human, and if they find your site to be in violation of their guidelines, they will manually apply a penalty. I think this difference highlights the murky nature of this topic as a whole… If Google themselves need to hire people to manually review the data, we are also very likely to have to manually review data in our analysis. Ever since the Penguin 1.0 update was released, link building and link profiles have been subject to a much more rigorously applied set of guidelines and rules. Prior to this, sites could and happily did get away with a lot more than they can now. Unfortunately, this mindset has not left this mortal coil and so every now and then you need to unpick a link profile made from spam and bad planning! But other areas can be less clear-cut, we have detailed the main areas that you should consider assessing for how natural the links are or could appear to Google. Looking at the anchor text (and alt tags) of links and identifying the amount of keyword rich anchor text links will allow you to determine if the profile is natural in this regard. It’s very unlikely that the majority of links your site receives will use the same keyword rich anchor text if they are naturally acquired. Even if you are using exclusively editorial links, you should not have more than 50% of your anchor text being keyword targeted. You should have at least 50% of your links be branded or not-keyword targeted to be safe. Even within this you need to create variation; having 50% of your backlinks all use the same anchor text or target the same keyword is also a sign that your profile is being unnaturally constructed to manipulate Google’s algorithm. Keyword usage should vary (naturally), for example; not everyone will search for ‘electrician London’, some will search for ‘London electrician’, others may search for ‘electrician in south London’… Reflect this in your keyword rich anchor text. This is one of those areas where there are some objective thresholds (as mentioned), although competitor analysis may identify some wiggle room within that. 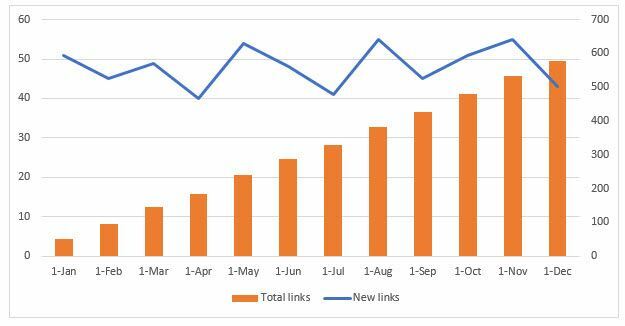 This is very common, if a site has been acquiring links at a rate of 50 per month, on average, over the past 6 months; it would be very unnatural for it to suddenly start acquiring 500 new links per month. Hence, this is a relative metric that needs to be derived from the data, both your site and that of competitors. 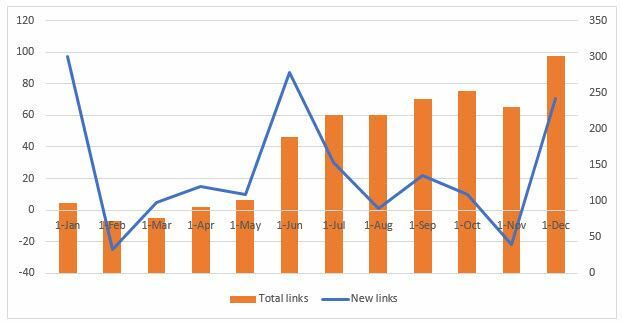 The chart below shows a much more irregular profile that is losing and gaining links in large numbers each month. This has created large jumps in the number of links from month to month. This would be something that needs looking into, to find out why it’s happening… It may be that these are affiliate links for products that are constantly being removed or changed, for example. There are many possible possibilities to say the least, but the ruler that you should use needs a scale of natural to unnatural to measure with. This type of analysis can provide insights into how many links you can expect to grow your profile by without risking a penalty… But it can also point you onto a path of investigation. 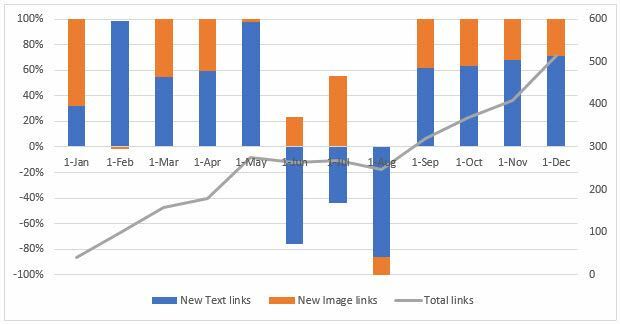 Here you can see the ratio of text to image links, plus the trajectory of your total number of links over time… There are many ways to cut this data or represent visually, it’s always worth testing so you get a feel for the strength of each type. This is a manual job and should be performed ideally on a pre-filtered set of links… If you have a bunch of backlinks that you have identified as being potentially unnatural, you will want to manually review them. Look at where the link is placed on the page, is it a contextual anchor text link, an image, is it in a menu or the footer? If someone has been buying cheap links, you might find that the page only contains 3 links and no real content, but you’re trying to establish if this link is legit. There’s no formula for this, you just have to look at the page and the link and ask yourself if this is natural. You can spot check links on small link profiles, but for enterprise sites this is virtually pointless unless you get lucky… And luck isn’t a strategy! We touched on this in the above section, but if you are manually checking a page’s content you will want to assess whether its relevant / how relevant. Link schemes will often create links from words in content on link farms of PBNs (Private Blog Networks) that would look out of place to a human. If there is no reason for there to be a link from this page or domain to your site, this is a good indication that the link is bad. Even if you are unsure, its typically better to walk on the side of caution, especially if this is not an isolated phenomenon. You can use other methods to more quickly assess the relevance of the page or domain, by crawling the linking page and root domain (if different), you can pull out the page title, Meta description, & H1 to get a feel for the relevance. You can also crawl the linking page and root domain and search for a range of relevant keywords to see how many times they appear… Both of these techniques can help to boil a large list of pages down to a smaller one. Majestic also offer categories for linking domains, you can use these to filter out the ones that seem unusual or unnatural. If you have performed a competitor analysis, you may notice that your site has a completely different profile to all of the other sites… If this stands out in certain ways this could be a potentially negative indicator to Google. If your site’s distribution of links, link types, the average authority or link frequency is significantly out of synch with the competitive benchmark; this could be cause to dive deeper and look into these specific areas to ensure that guideline are not being violated. This is not in and of itself a problem, but it can be a top-level indicator that can help steer your analysis in the right directions. In some cases, you may be able to spot certain techniques like blog comments and forum spam… These are obvious to spot manually and are a very strong indication that some poor link building techniques have been implemented. If this is the case, you can often narrow your analysis to the links acquired during the period that the cowboy SEO agency where managing the link acquisition. We cover in much more detail, the different bad link building techniques later in this guide, once you know the techniques, you will be more likely to spot them. We have covered some of this in the above section, where we cover spotting unnatural links, here we provide a little bit more insight and include a broader range of techniques. The aim of these techniques is to filter the data to allow you to look more closely at the links with the highest potential for being dangerous. As mentioned there are a lot of metrics that you can use but all you need are two reliable metrics for authority and trust. Typically, you want to focus your attention initially on the bottom quartile of the links in terms of their trust or authority. If the highest authority / trust link you have is 60 and the lowest is 3, you might want to look at the links that fall between 3 & 17, prioritising the lowest values first. This does not mean, that all these links are bad, just that they are more likely to be bad. You can manually spot check these or pull in additional information about them to move down to the next level of analysis. You can always combine metrics from different tools and compare these to build a bigger picture, but we find that one for each will do the job. Several tools provide this data, either pulling it in or downloading it will enable you to quickly filter to look at those that do not seem as natural. We covered this in the previous section, but it’s very easy to manually look at this (in the form of a list or a pie chart) and get a pretty accurate impression of if its natural or not. If you spot a type of domain or URL occurring, or you notice all text links from URLs with ‘blog’ in them, you may be able to more systematically pull out suspicious data. Obviously, this relies on there being a pattern, but in cases where; someone has employed an agency or freelancer to build links, and they’ve used dodgy tactics, there are often patterns to this behaviour. In this section, we cover all of the most common bad link building techniques being used at the time of writing or in the past. If you are straight up buying links, especially from a place that offers ‘links for sale’, this is something Google specifically do not want you to do. If they detect this behaviour, your site will receive a penalty. There are some grey areas to this that we want to clarify; this does not apply to something like buying a listing in Yell. This is an obvious marketing activity, and you are not just buying a link, you are buying a listing. Paying for submissions into hundreds of crappy directories that no-one has heard of or uses is pointless and potentially dangerous. Is the content going through an editorial process? What is the quality of the content like on this blog / site? Are you doing it just for a link? / Does this provide some other value? These questions are to determine whether it’s safe to go ahead with type activity on a specific site, they do not help you to determine whether you should do it. You would need to assess a whole load of other components and metrics to determine whether its value for money. Buying a link while providing no other value to you or the user. A legitimate cost of doing business, where business is not exclusively getting a link… such as getting your product in front of a new audience. Going onto forums and posting links to your product or service, usually completely uninvited and in an irrelevant context, is forum spam… Don’t do it. Going to forums and contributing valid useful information appropriate to the context of the thread. Linking from a profile page rather than individual posts, this can build reputation and naturally result in directing people to your site. Going onto comment sections and posting links to your product or service, usually completely uninvited and in an irrelevant context, is comment spam… Don’t do it. Going to comment sections and contributing valid useful information appropriate to the context of the blog or conversation. This shouldn’t be a link building activity. Content spinning or auto-generating content is a very poor method of producing content, the quality is usually very low to terrible and its solely designed to manipulate Google’s algorithm. This content is syndicated out to low quality sites, PBNs, content farms, etc to be used as context for links. Although typically the content is not on your own site, this is easy to spot for an algorithm and is consequently likely to result in a penalty. Any kind of content spinning or auto-generating is to be avoided. There is no right way to spin content, the right way is to produce high quality, unique content of value to users… and use that to link to your site or attract links to it. There are directories all over the net for everything and most of them are completely useless or potentially harmful to have links from. This kind of activity if spotted is good sign of bad link building. Automated or assisted directory submission tools or large-scale directory submissions. Use high quality, relevant, popular directories… You don’t need to submit your site to even 50 directories. Unless your site is related to the adult themes or gambling, you do not need or want links from these sites. This is bad association and you really don’t want your site connected to the murkier and least trusted end of the web. Getting links from these types of sites. If your site is in either of these industries then crack on with building links from these types of site. Sites containing illegal content, or products and services that are illegal are not good sources for links. Google will not trust them and by having them link to you, your site starts to move into their neighbourhood. There is no way to do this ‘right’! As mentioned already in some depth, acquiring links from sites that bear no relevance to your site are poor sources of links. Although there are exceptions where you may team up with another business with little relevance for legitimate reasons, these types of link should be minimised. Building links to get links from sites that bear no relevance because, links! Done in moderation and with some explanation on page to justify this. Provides some value or relevance other than a link. If you are controlling even a portion of link’s anchor text, the temptation may be to optimise all anchor text for your target keywords… This can be dangerous and has the power to result in a penalty from Google. Having more than 50% of your anchor text targeted to keywords. And / or lack of variation in anchor text in general. No more than 50% of anchor text optimised for target keywords and good natural variation within the anchor text. Google purged a lot of PBNs back in 2014, ever since then this should be considered a risky endeavour as its primarily aimed at improving rankings while providing no other real value. It’s often considered easier to use this approach than to do it properly, the clue is in the sentiment there! When it comes to link building you should do it properly. PBNs are blog networks that exist to pipe authority into a primary site in order to improve its rankings. Often dodgy techniques are used to inflate the authority of sites within the PBN, to make them more valuable to the principle site (the one you want to rank). It is an almost inevitable consequence that PBNs provide little to no value to users and are thus, not wanted by Google. Using PBNs to inflate rankings. Some may argue differently, but there is no safe way of doing this. These are a group of webpages designed with the principle aim of linking to a target page, to improve that page's rankings. These are considered black hat techniques and Google will penalise sites that use them to inflate rankings. Using link farms to inflate rankings. There is no safe way of doing this. For some time, these links were the best thing that had happened to them, despite the stories putting a lot of people off. Links from high authority news sites, lovely! However, Google updated their algorithm and it became much better at determining context… Almost immediately the sun stopped shining for them and they lost all the value that the links had once provided. There’s probably a few morals in that story! The outtake is that the context of a link can impact its value, Google can now tell if you are slamming a site or promoting it. Otherwise known as sitewide links, this refers to the act of repeating the same keyword rich anchor text links throughout most to all of a site. Typically, this is the result of a footer that sits on every page and doesn’t change. Again, there is a grey area to this, simply having a thousand links from one site will not get you a penalty, it’s only if those links are all keyword optimised and in large volumes. Using anchor text like ‘buy red widgets online’. Using anchor text like ‘red widgets’, and ensuring that the link comes from only the home page or a handful or relevant pages. This doesn’t mean that you can’t use reciprocal linking, just that you do not use it either excessively or in irrelevant situations where you have just exchanged links with someone for no other reason. Sporadically done, where relevant and not for the sole purpose of getting a link. Does this provide value to users? Does this provide value on in the form of a link?